Oh my goodness it is about time this gets posted, right? I mean, our trip to Italy was literally over six months ago but no big. 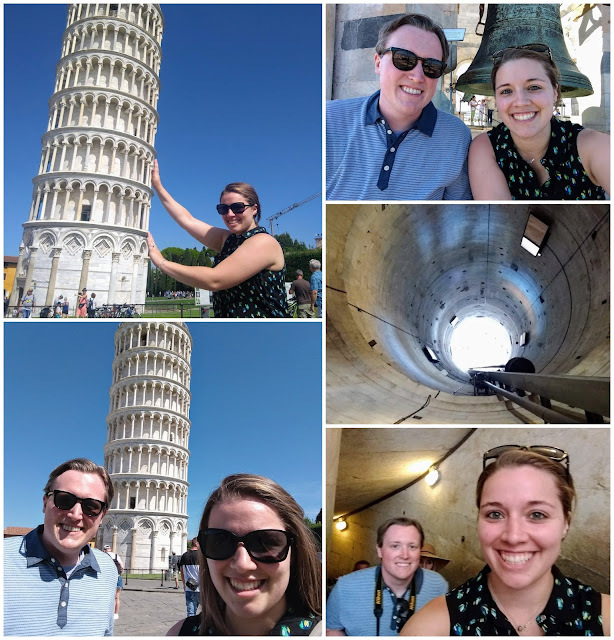 I've recapped our time in Rome (part one and part two), Vatican City (part one and part two) Pompeii, Venice (part one and part two), and Milan. 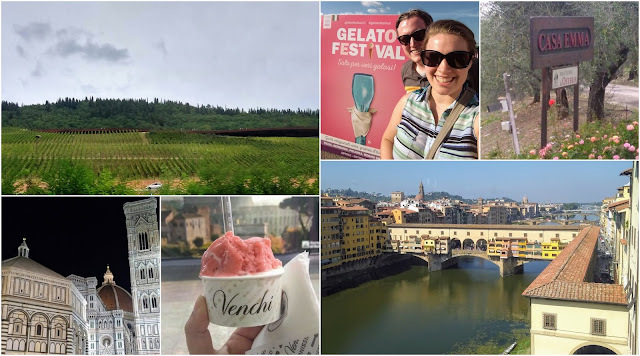 Now it's time to share how we spent our final days in Florence! 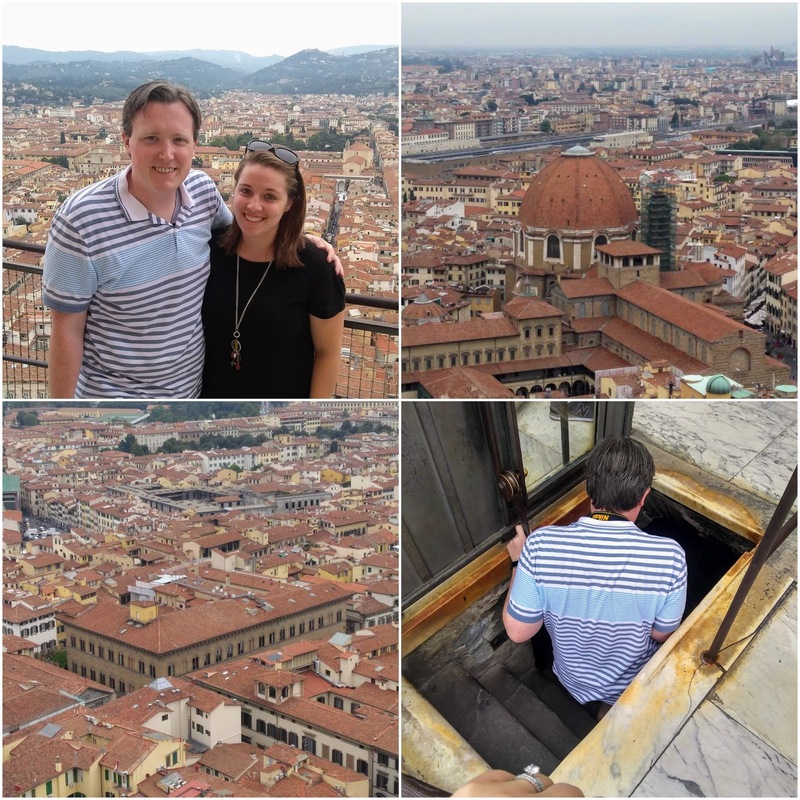 No sooner did we arrive off the train in Florence did we fall into our first adventure. As we were making the brief walk from the train station to our hotel, we were greeted by a road closure. Annoyed, we turned around the other way to go around the block. Later on our way to explore, we saw the square was still shut down. We were curious so we investigated and we soon found out the square was closed because there was a movie being filmed! The movie is Six Underground which is coming out on Netflix pretty soon. I think that green car will be important. 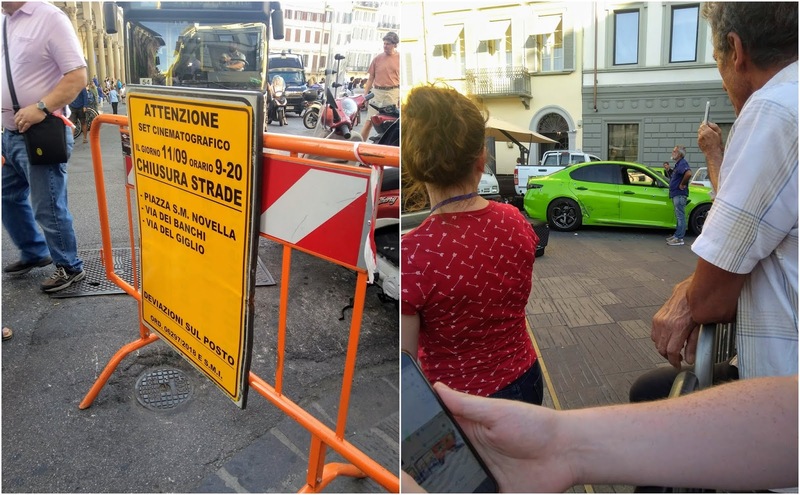 We saw them shooting a chase scene right there in the middle of the road in front of the Basilica of Santa Maria Novella. After we had some dinner we walked to Brunelleschi's Dome to take some #nighttimepics. We were planning to climb the Duomo the next morning, which we ended up doing and oh my goodness there were so many steps in some many conditions (just look at the photo below...it looks like I'm in an ancient basement but really I'm climbing the rounded part of the dome!). 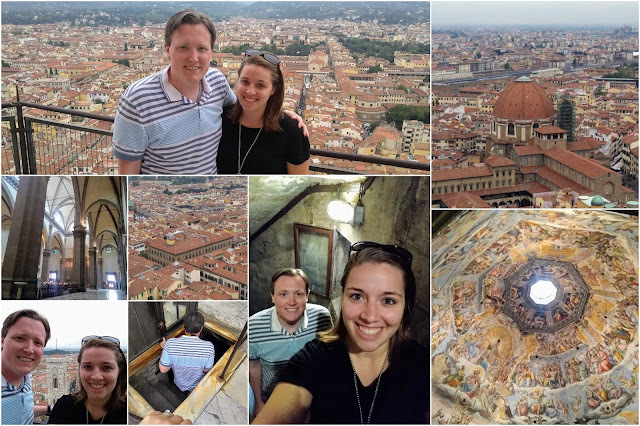 We didn't plan to go in Santa Maria del Fiore, the cathedral that houses the Duomo, because even early in the morning there was a 3 or so hour wait. But it worked out because when we were entering the stairs to climb the Duomo you get to walk through a portion of the cathedral and you end up seeing it anyway. So travel hint: Get the timed tickets to climb the Duomo and skip getting in line for the cathedral. It will save so much time and you get to see both anyway! This is the view from the top of the Duomo. 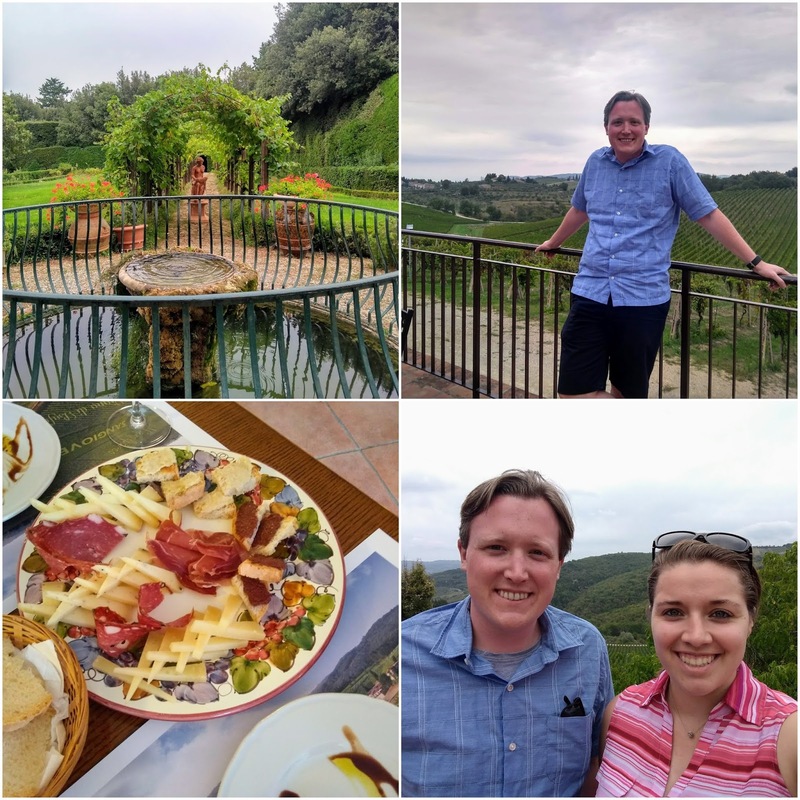 After enjoying the quad and glute workout we had while climbing the Duomo, it was time for a wine tour in the Tuscan countryside. We visited tour vineyards that made Chianti, which I learned was made in special barrels. We also had a little tasting of Tuscan olive oil and some cheese and meats. Everything was so so delicious and Husband enjoyed the wine! 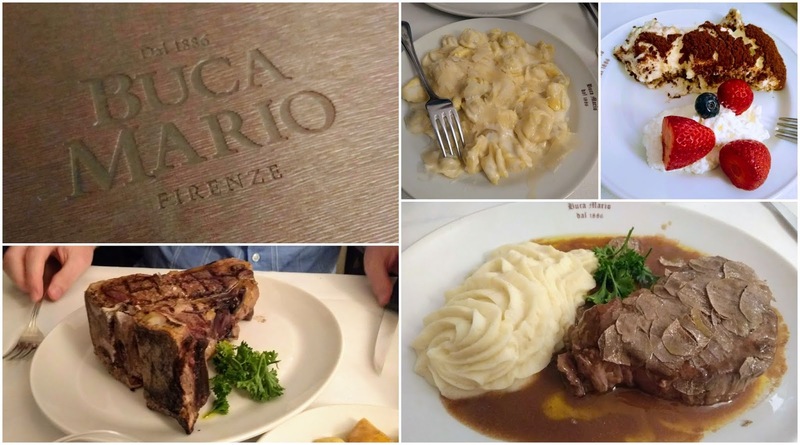 After the vineyard we enjoyed a little dinner at Buca Mario. I had to add the photos of the food we ordered because it was literally my second favorite dinner of our whole trip. How beautiful is that food? The next day we took a day trip to Pisa, which was only an hour or so away by train. We purchased timed tickets ahead of time so we were able to get right in line. However, they force you to check all bags, including purses, so we had to do that first (it's free). Then we began to climb. It was so weird because the middle of the tower is empty and ask you walk around the steps you feel the lean of the building. But once you're at the top there's this amazing view. You know what's funny? I was so accustomed to seeing the Leaning Tower of Pisa it never crossed my mind to wonder what the surrounding area looked like. You can see the cathedral and baptistery and the little surrounding town. And we were so lucky we were on the train when we were because a couple of girls next to us were talking about Gelato Festival being held in Florence. 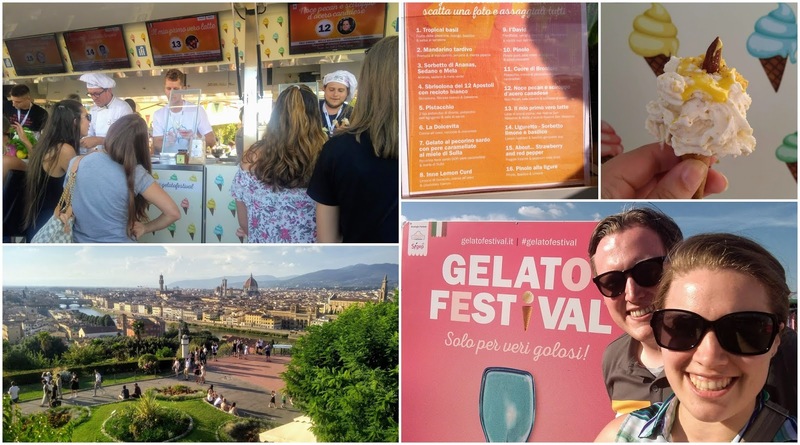 After a bit of research we learned the Gelato Festival was ending the following day so we extended our hotel to spend another day so we coudl squeeze in a trip to the festival! The following morning we walked over to the Galleria dell'Accademia to see the David. How could we come to Florence and not?! Did you know a deranged psycho damaged David's toes with a hammer in 1991? Or that the statue was in danger of collapsing because of weakened ankles due to years of vibrations caused by the hoards of people who visit? Or that he is 14 feet tall?! I love visiting museums...we always learn so much! We also saw a hanging portrait by Florentine street artist Blub while we were walking to the Galleria. He is an anonymous street artist that takes famous paintings and adds scuba gear. I just happened to read about Blub in a magazine that was in our hotel the night before so I recognized it when I saw it. Then we hustled back to the train station so we could get our train to Rome and catch the flight home. Phew! After all that we have finally reached the end of my Italy recap! Thank you for reading! So let me ask you, have you been to Italy? 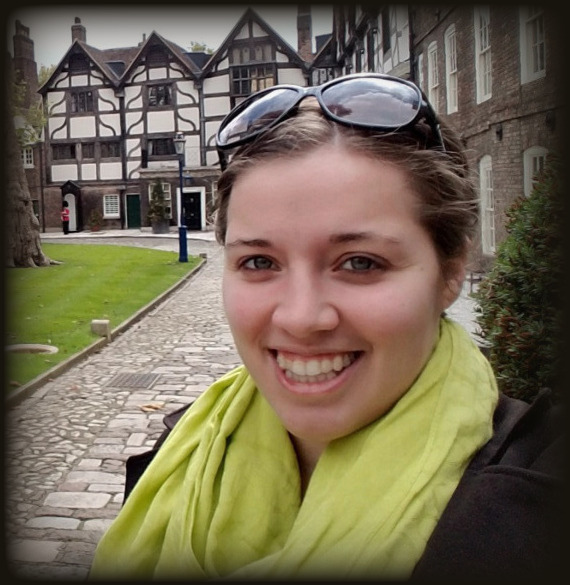 Where did you visit? If you could do one thing in Italy what would it be? Or better yet, if you could have one meal in Italy what would you eat?